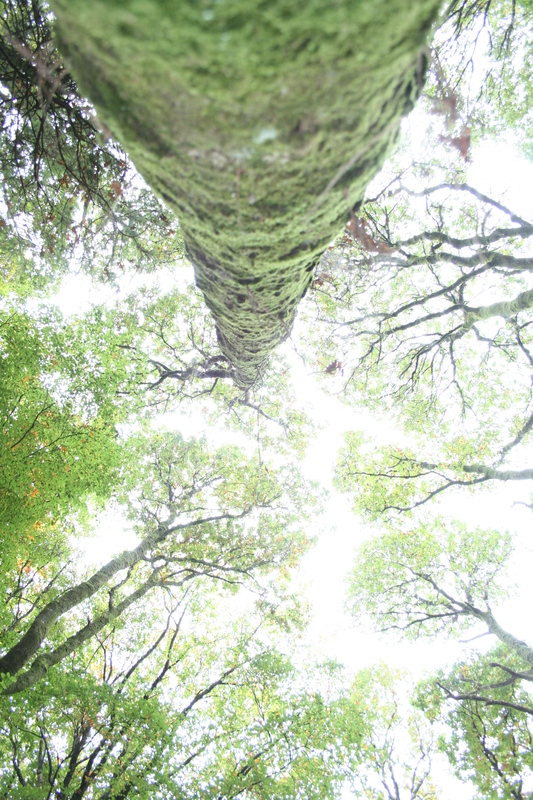 The Irish National Heritage Park is the largest open-air archaeology park in Ireland, showcasing the architectural and archaeological heritage of Ireland, from the Mesolithic period (9000 BC) to the Norman invasion in the 12th century. 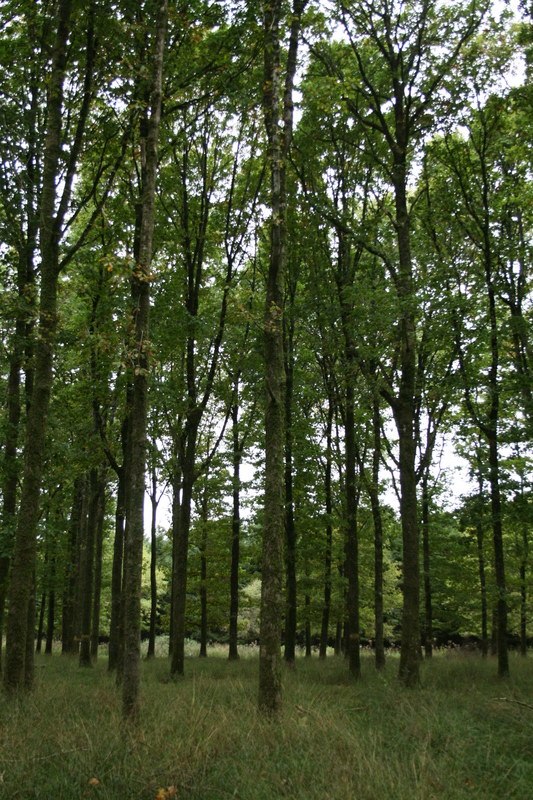 The park was conceived by Dr Ned Culleton and members of Wexford County Council, the park was built by local craftsmen, FAS Workers and council engineers, and opened in 1985. In 2007-8 it was deemed the park was in need of refurbishing to enhance its structures and to bring it up to date as a modern visitor attraction, and to accurately represent the most up to date Archaeological information. The park management commissioned me to do a site by site survey, to assess the structures and to make recommendations on the refurbishment of the sites and their related costs, with the invaluable help from Ronan O’Flaherty at Cranebag consulting, the park manager Maura Bell, Wexford county council and the School of Archaeological U.C.D. 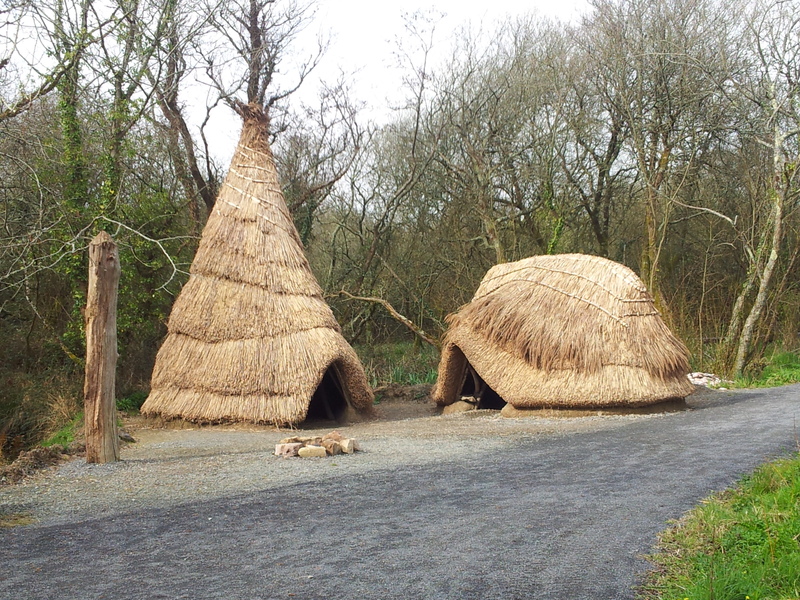 The Irish National heritage Park, procured Government funding from Failte Ireland in 2010. With my survey specifications and estimated costs a tender document was drawn up by Ronan O’Flaherty and the project was put up for public tender. There was worldwide interest in the project with bids coming from India and Asia. The tender was awarded to Muintir na Coille Co-Op Ltd, and work started in late 2010. The refurbished Park was officially opened on 12th July 2013 by Brendan Howlin TD, Minister for Public Expenditure. It consists of no less than 16 sites, manyof which were completely rebuilt under my direction. These include a fullscale Neolithic longhouse, an early medieveal Ringfort, a Viking village, and a Crannóg (or lake dwelling) which includes the largestroundhouse ever built in Ireland. My buildings featured prominently in the internationally acclaimed RTE series Secrets of the Irish Landscape and in a number of other documentaries from both RTE and BBC. This site is based on the excavations at Mount Sandel, Co Derry, and data from other Mesolithic sites. 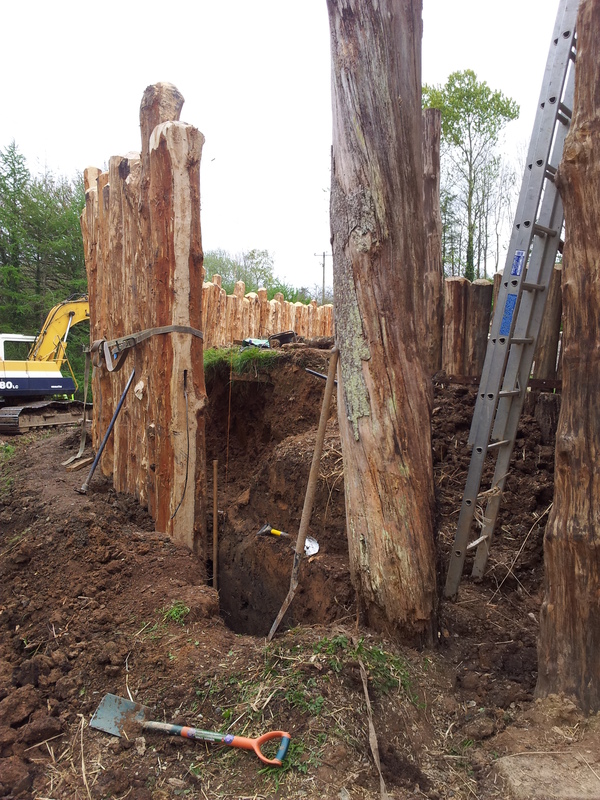 The two structures are interpretations of ground data, and have been scaled down to one third scale to fit the site. The oval structure that looks like an upside-down boat is more representable of the type found in Ireland. 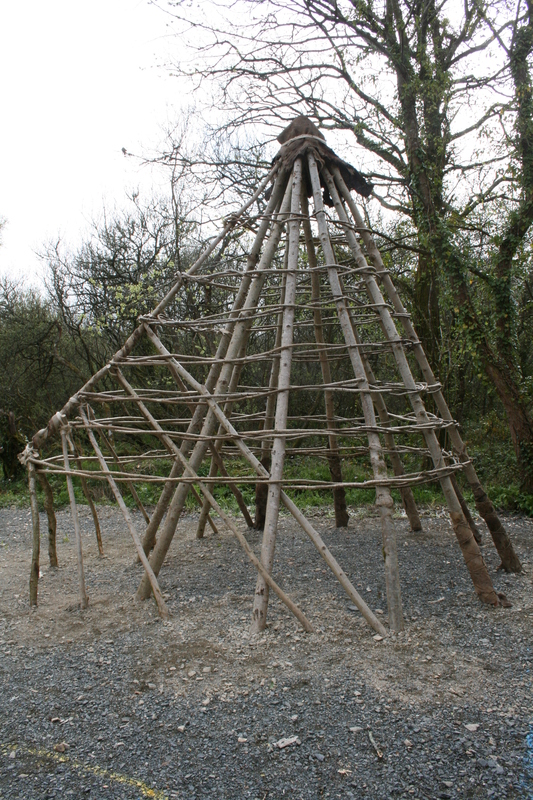 The tepee style structure is known as a “Howick house” from the area in Northumberland were it was first found, this type of structure is a “common” structure, meaning it was of basic design and quick and easy to build. Both of these house were sometimes built with pit floors (slightly sunken) or with earthen banks at the base. 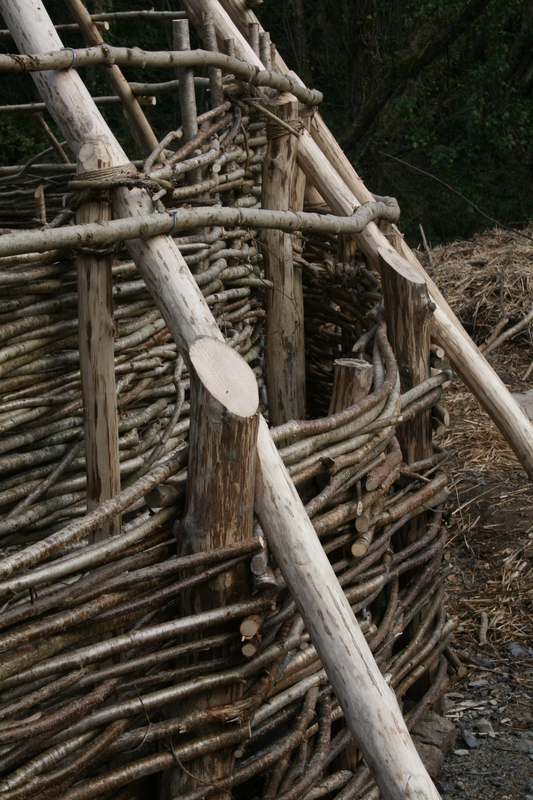 The timbers of the houses are tied to together using natural fibre twine and tree bast (inner bark) rope and woven Hazel rods. The houses were thatched by Brian Rogers with summer harvested Irish (loch Corrib) river reed, Mesolithic man may of used reed, sedge, birch, heather or a mixture of materials. The site also has a large upright Oak post, these posts holes have been found on a number of Mesolithic sites near to or above grave sites or offerings so are thought to be grave markers. Mesolithic sites are commonly found near to water courses and river estuaries, these were the easiest ways to navigate around the country. 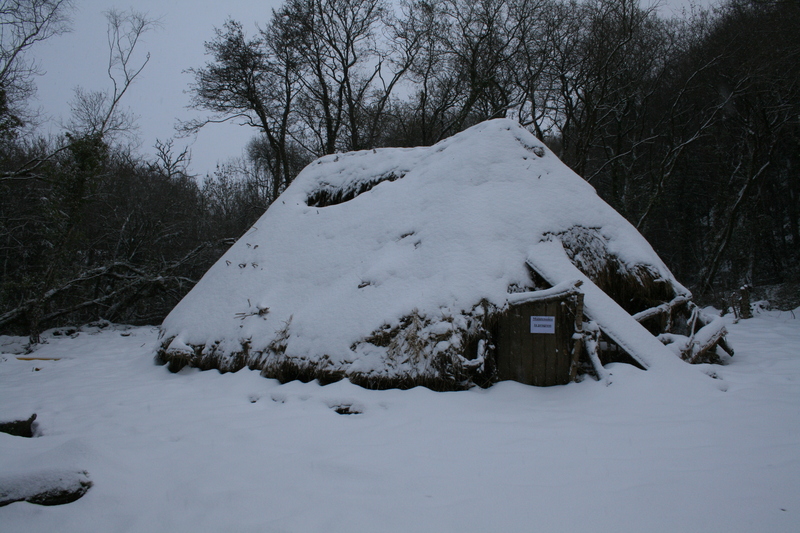 Mesolithic man is thought to have been semi-nomadic, living in small extended family groups, with seasonal bases being used to hunt game(wild pig) and birds, spear and trap fish (woven Hazel traps) , gather berry’s, nuts, fruit and eggs. Their tools were made from small chips or slithers of stone known as microliths, used to make blades, arrow heads, spear and harpoon heads, butchery tools and scrappers and many more items. Their way of life continued successfully for 3ooo years. 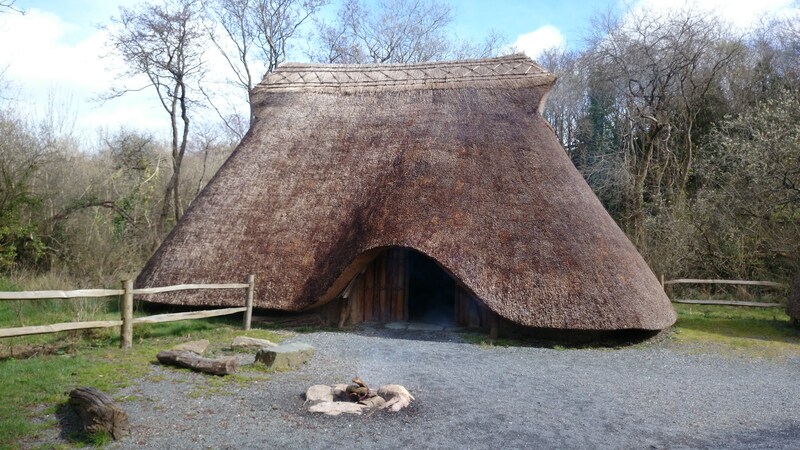 The Neolithic Longhouse is based on data from a number of Neolithic sites in Ireland, there are about 70 Neolithic house sites in Ireland. The earliest houses had walls of riven timer blanks, which were stood up in trenches and held in place with heavy boulders and rocks, later house used Oak posts with Hazel wattle covered in clay daub, some of these walls being double wattle with a filled cavity. All the houses from this period are rectangular in shape and range from 3mtr to 15mtr in length. 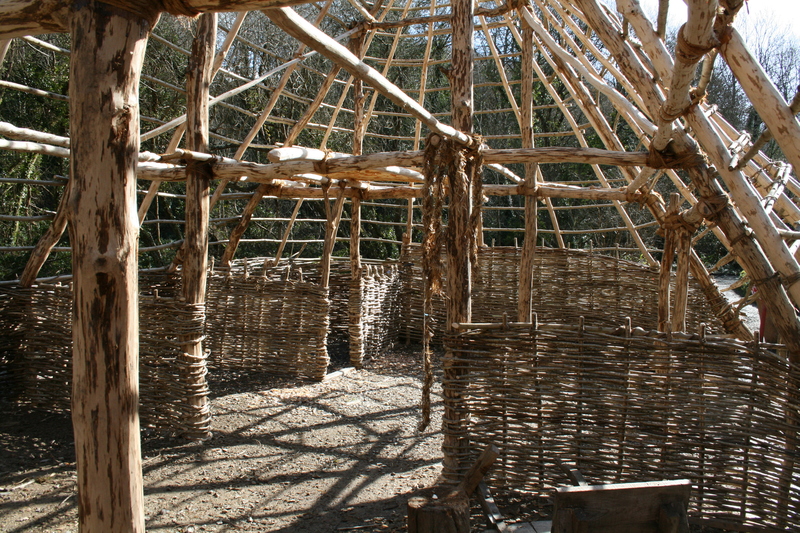 This Neolithic Longhouse is approx. 12mtr X 6mtrs eve to eve and 4mtr from ground to ridge-line. 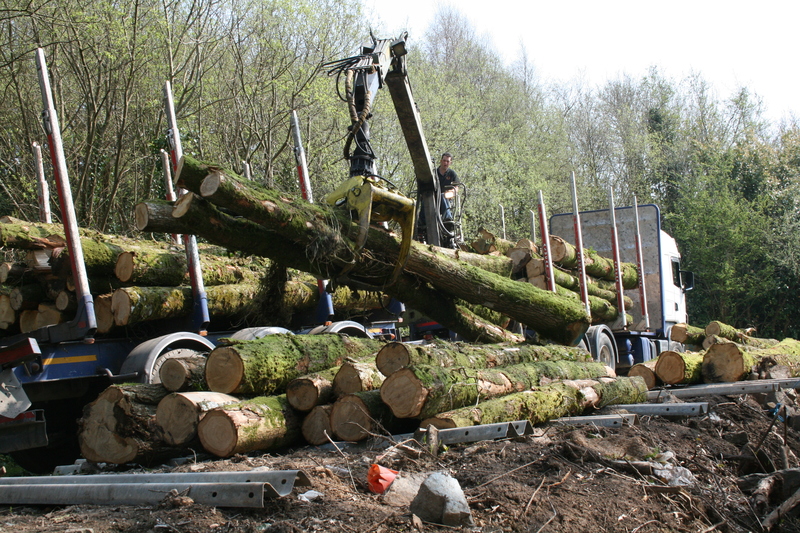 These house are easy to erect and extremely stable, due to their Oak “A” frame/twin post construction, the “A” frames could be cut, lashed together, replicated and very quickly hauled in to position. 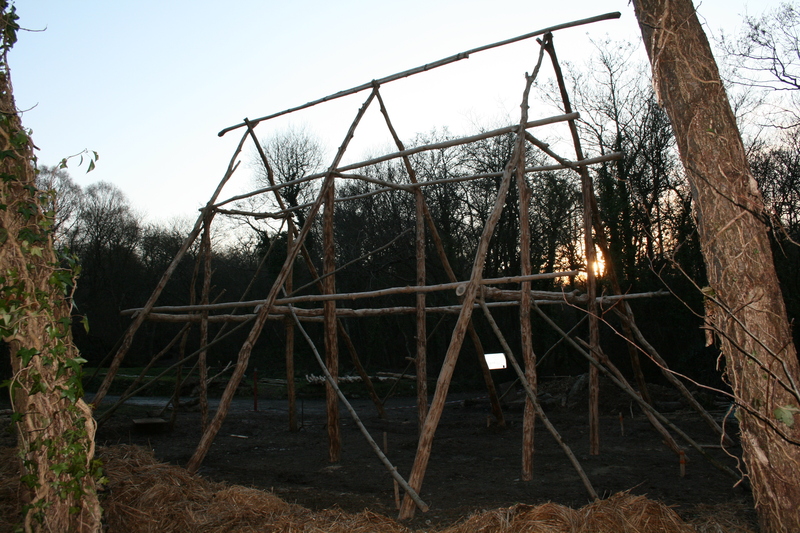 With a number of “A” frames in position and held together with (bents) purlins, the structure is then strengthened and stabilised with the Oak-post and wattle walls, further strength also comes from the Ash pole roof hips pushing against the gable ends. 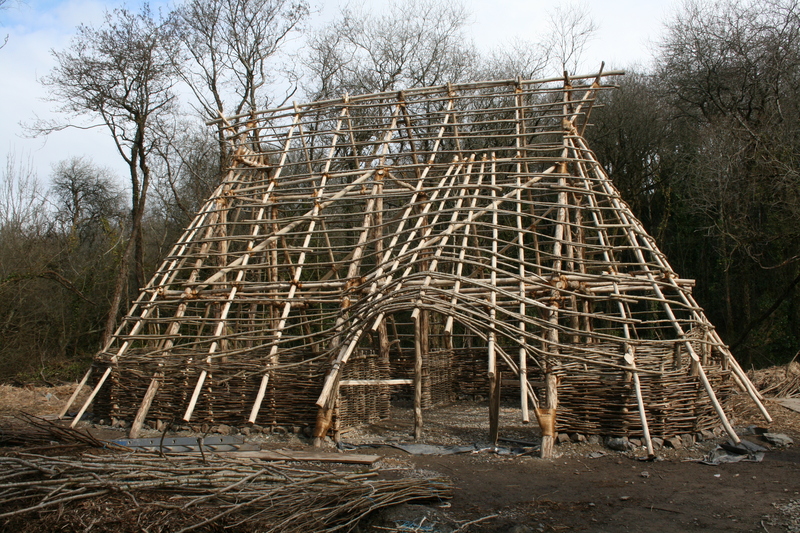 The roof structure was finished off with Ash rafters and green-ash batons, bent around the structure adding more strength. 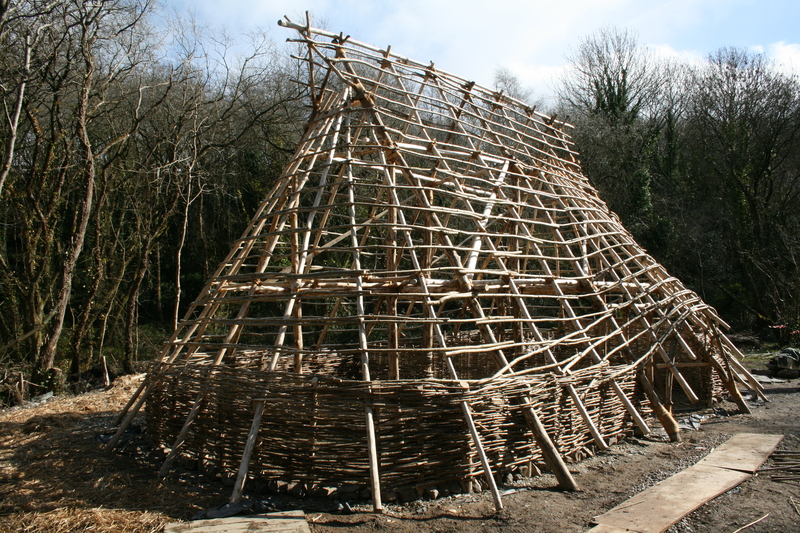 The high pitch of the “A” frames and their shape allows the reed thatch to come down very low to protect the walls and shed water efficiently. The pitch of the roof also gives a good volume of space inside the house, this enabled the occupants to use the roof space for sleeping, and for smoking and preserving food (not at the same time). When I designed the house, I brought the roof hips down to a point approx. 3ft from the ridge-line on the gable ends, this allowed me to incorporate smoke hoods, these allow smoke in the house to be controlled depending on the outside wind direction. Inside the house there are two rooms, the “A” frame twin posts forming a central isle, the centre pair of posts being thicker, these posts may have had a symbolic meaning. The door of the house is off centre, I designed the door to allow as much light as possible in to the house, with the planked Alder door surround, reflecting the planked wall construction of earlier houses of the period. With the door off centre the area within the door would have been the work area. The Longhouse also has a small pen to keep young animals in, with a sleeping loft above. The room beyond the central divide has the hearth and a very comfortable communal sleeping/living area. With the high roof, smoke hoods, low eves and usable door, the house is light, airy, warm and comfortable. The small building to the right of the house is a food store room. Built using the same materials and technics. It would not be suitable for keeping animals in, as there is not enough ventilation making it unhealthy for livestock. There are many types of Ring-fort some simple timber palisade, some built of stone (cashel) and some were defensive structures, but all were owned by the wealthiest people in society. And there opulence reflected there status. This Medieval Ring-fort is based on a wealthy merchant-craftsman home, and comprises of three buildings, a large main house with Souterrain, and a separate dairy, both built with stone walls, and an open timber workshop structure, all within an impressive Oak palisade and defensive ditch, with a watch-tower entrance. This Ring-fort was built to impress. This was the biggest challenge, on the project due to the engineering and the material requirements. 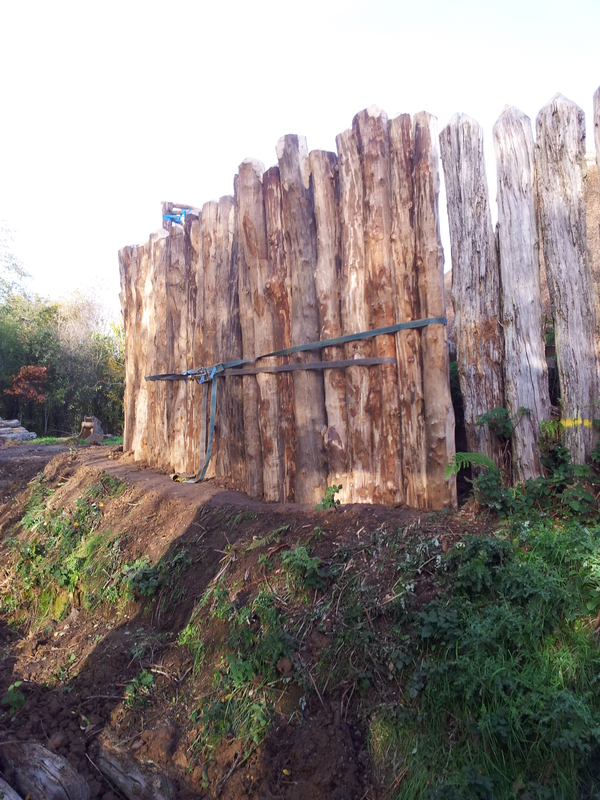 The outer palisade alone required 333 large Oak posts (trees) just over 75% of these Joe Gowran and I procured through Coillte with the help of John More, the balance of the Oak was procured by Joe Gowran, after a great deal of negotiation with the National parks and wildlife service, and came from the vale of Clara, Co Wicklow. 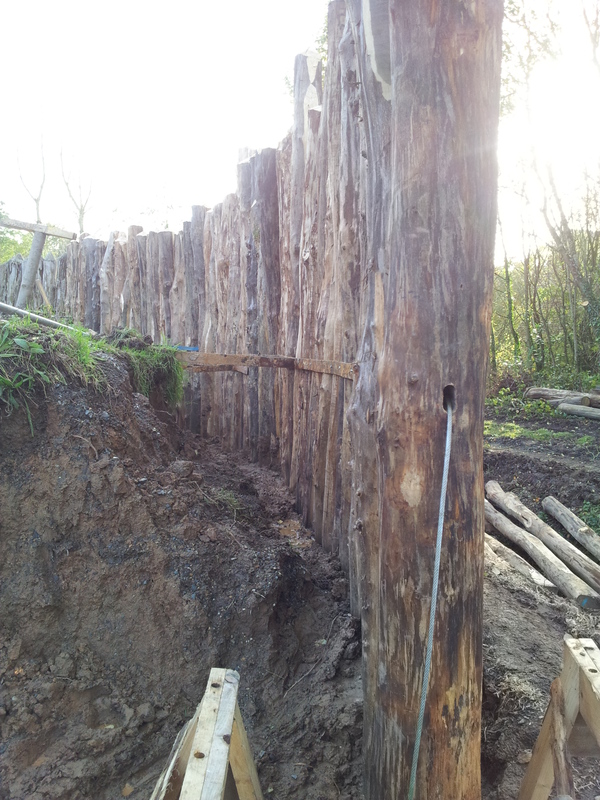 The engineering of the palisade was slow and difficult, each 4.5mtr Oak post had to debarked and then milled flat on opposing sides, transported to the site where the tops were axe cut to a point and a narrow slot was cut through from flat side to flat side at a predetermined height, this was to allow a steel cable to be threaded through the posts. As we built the new palisade, we had to dismantle the old rotten palisade, this was done in short sections using a Hi-mac machine fitted with chains to pull them out, a slow and dangerous job as many posts would snap off in the ground. 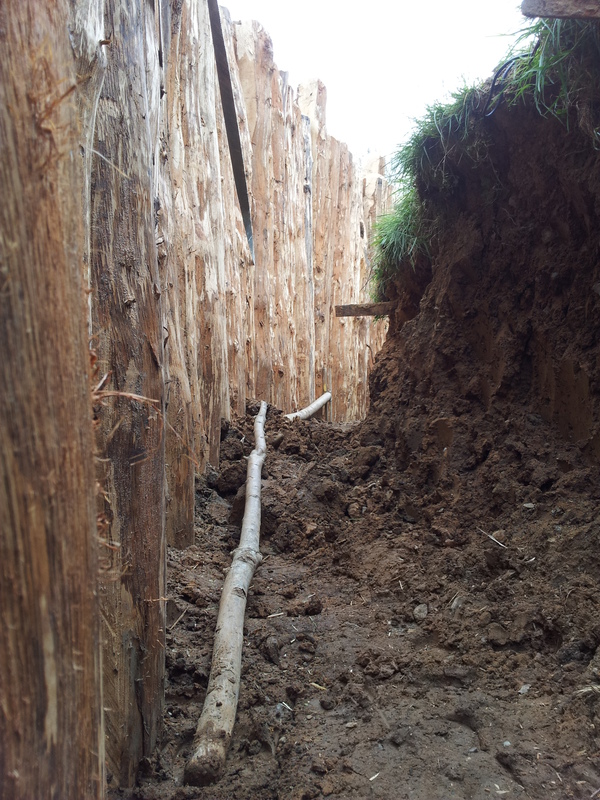 So as we pulled out 3-4 old posts, we would have to dig out the trench to accept the new posts, this was also heavy dangerous work as the trench sides could slip in without warning, and broken posts would have to be dug out by hand, the bottom of the trench was often filled with water. 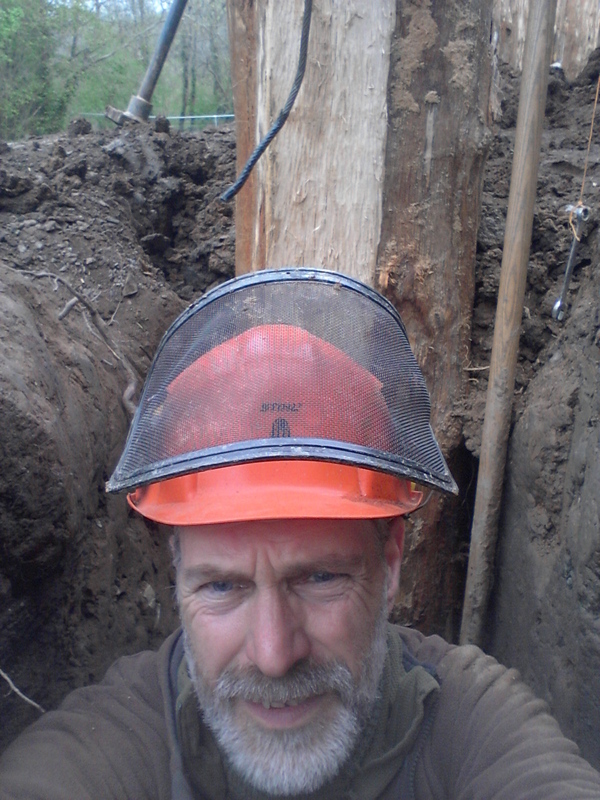 The new posts were swung in to the gap between new and old posts, with only room for one person in the trench, lowering and positioning these ½ ton posts was challenging as we had to match flat sides, line up the slots, thread the steel cable and stabilize the posts in the trench, before pulling out more rotten posts. Before the palisade was completed the watch tower had to be constructed. I designed the watch tower, to be constructed using pegged Mortise and Tenon joints. 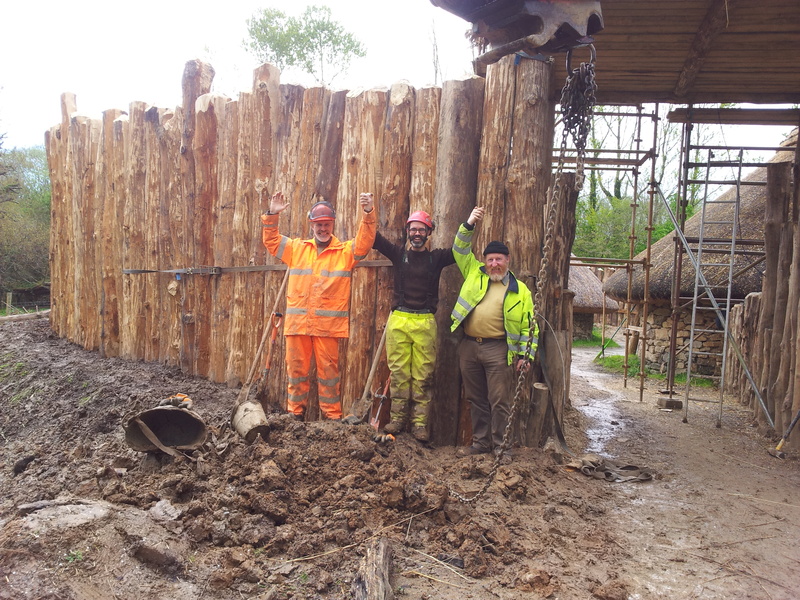 The four supporting Oak posts are 8mtr long, set 2mtrs into the ground, with pegged cross braces set at approx 2 mtrs spacing, forming the roof of the entrance, the floor of the upper watch tower and bracing for the riven ash roof timbers, supporting the thatch. The strength of the tower is in its bracing and mass construction, as it is part of the continuous palisade and incorporated in to the heavy entrance structure. 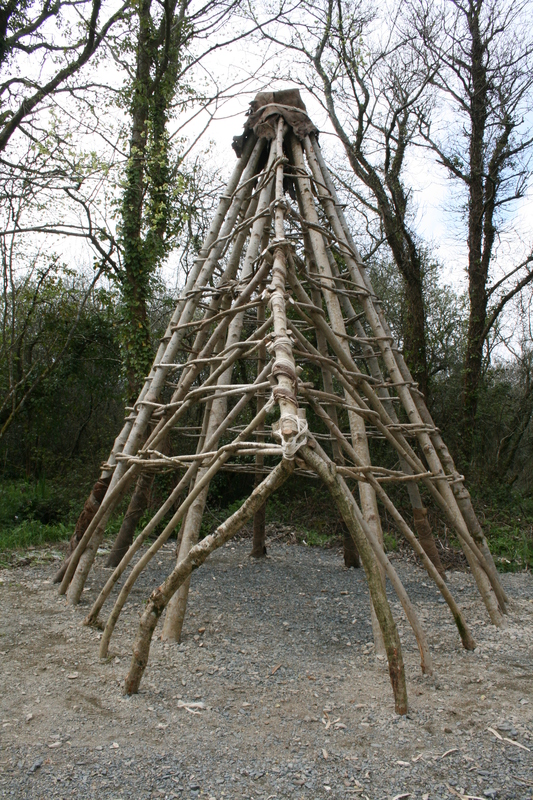 The front legs of the tower act as tensioning points for the steel cable that runs around the palisade within the oak posts. The other new structure in the ring-fort is a pegged pole-frame workshop, this building I designed to replace a small unused stone pig-sty. My design was for an open workshop big enough for me to operate my pole-lathe, and other craft workers to work within the space with enough under cover room for visitors to view them. All the roofs were rethatched. By a team of Thatchers, Brian Rogers (main house, watch tower and workshop) Peter Compton and Susan Boukovski (Dairy). The main house was fitted out with a covered bed, communal bed, sleeping loft and storage cupboards. The house and Ring-fort can be rented for weekends, for more information please contact the Park Managment. Horizontal water mill 600 AD. The horizontal water mill heralded the first industrial revolution in Ireland, before the arrival of this technology all grinding was done by hand, a slow and laborious process. Water mill technology spread throughout Ireland very quickly, and mills were built by wealthy landowners, monastic orders and many small farmers formed Co-Operatives to share mills and profits. The mill was in need of a complete overhaul, so the first job was to re-thatch the roof, this work was carried out by a local thatcher James Dillon. My remit was to restore the mill to working order, as the mill had stood unused for over ten years. My first job was to dam up the millpond and replace the sluice-gate and frame. With the new sluice in place I could turn my attention to the operating mechanism, as the old mechanism had rotted away. After some research, I decided to use a Cantilever and wedge operating system, the new mechanism was made from Oak above the waterline and Green-heart below the water for durability. The mechanism works via a pivoting cantilever, through the top of a large Oak post (lightning post) that goes down through the floor of the mill loft into the bed of the Race (river bed). The short end of the cantilever is linked to the top of a second lighter post (riser), this post is linked in parallel to the heavy post, and the bottom end of the riser (lighter post) is attached to a long underwater cradle, that the bladed waterwheel sits in. The bladed waterwheel has a centre drive shaft that is attached to the top grind-stone in the mill loft above. How it works, It takes two people to operate the mill safely, the miller in the loft pushes down on the long arm of the cantilever, which pivots in the lightning post and lifts the riser, and in doing so, lifts the cradle, waterwheel and top grindstone clear of the bottom grindstone. The miller as he holds the cantilever down, can then slide a wedge into the pivot slot, between the cantilever and the top of the lightning post. This wedges the top stone in its highest position (open). The miller then asks his mate outside to open the sluice-gate allowing water down the flume, this generates force at the waterwheel (the top stone must be raised (open) before the sluice gate is opened, or the waterwheel blades could be sheared off). When the waterwheel is turning at maximum speed, the miller can adjust the top grindstone by using the cantilever and wedge, to obtain the desired grade of flour.